Okay, so I have kind of screwed up my posting schedule with this fitness challenge. My apologies! I have been completely overwhelmed with a gazillion things going on but have remained completely faithful to this program! 😀 I’m going to try and make sure these are posted every Friday. My measurements were taken on time though so this will still give you an idea of what results to expect. I think I’m going to wait to post my progress pictures until they show something really drastic… does anyone have an opinion on this? I feel like only I see the tiny differences each week, so maybe I’ll post after the 6th week and then again at the 12th? Plus (sorry for the TMI) but this week was my time of the month so my pics don’t look that great. I’m all bloated and puffy. You can see me at week one here. I’m totally happy with my progress for just one week. My body is feeling really good and full of energy. The workouts are a challenge, but not completely insane. I’m not so sore that I can’t function. And the diet plan is phenomenal. I’m rarely hungry and because Nicole teaches us to prepare a week’s worth of food all at once, I’m so food-obsessed. I know what I’m going to eat and when and it’s ready for me to grab. So it’s totally idiot-proof! So far my greatest struggle is just getting enough water. We’re supposed to get a gallon a day and that’s proving to be really tough with school. There are no food or beverages allowed in the lab and those last 3 hours, so I’m all over the place with getting my water in. Not to mention, allowing myself enough bathroom breaks! Sheesh! But I know the key to success is hydrating so I’m trying! 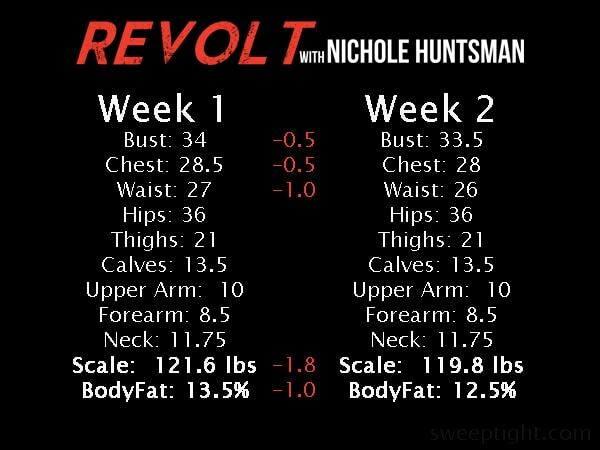 Revolt Fitness is great for anyone looking for a guided plan to getting in shape. Nichole Huntsman is inspiring and so sweet. I am truly honored to have this opportunity! For just $10/month you can too! I’m impressed that you are already losing inches! GOOD FOR YOU! you are doing great! Way to go, can’t wait to read your progress as you go!